I am so excited for the Super Bowl this year, especially because The Patriots are going!!! The Super Bowl is one of my favorite times to throw a fun house party. 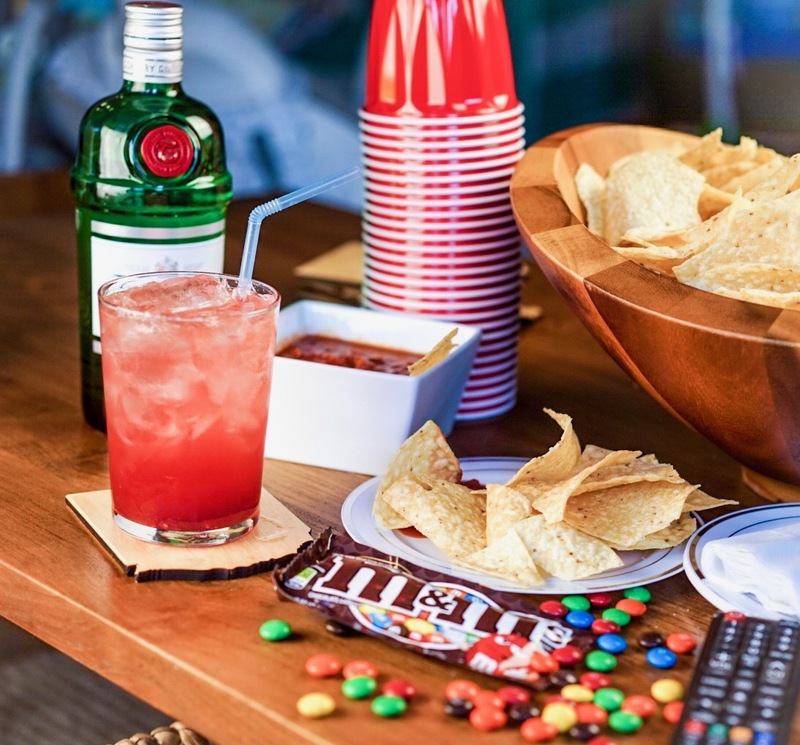 I invite all my friends and family to watch the big game and make so many delicious snacks to munch on while watching. 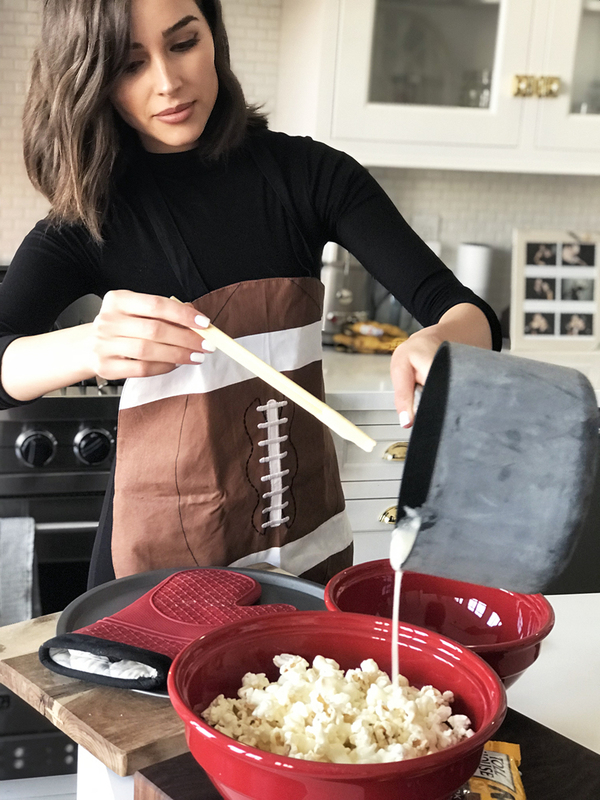 Check out my favorite recipes to make so you can be the MVP of your own Super Bowl watch party! And don’t forget to get yourself a football apron so you can get in theme while cooking! I got some of the ingredients for the food, cocktails, and party supplies on Boxed. Better yet—if you’re in CA use my code OLIVIA20 for 20% off your order (must include liquor). Can’t wait to see how you guys put together your Super Bowl Party!! If you don’t live in California, use OLIVIA10 for 10% off your order (spirits only in CA). 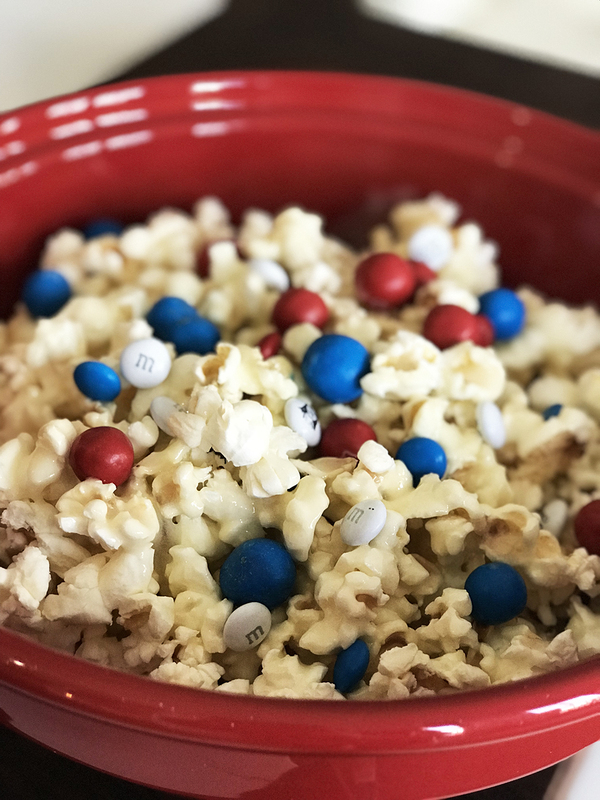 No matter who you’re rooting for, this sweet popcorn recipe is a delicious way to show your team spirit. Melt butter in a saucepan and add marshmallows. Stir until marshmallows are melted. Pour the marshmallow mixture over the popcorn slowly, making sure most of the popcorn is covered. Leave a little bit of the mixture leftover. Place popcorn onto a cookie sheet and drizzle the remaining marshmallow mixture on top. Add the M&M’s, then break into pieces and serve! Get your usual pigs in a blanket in the football mood with some easy condiment decorating. Preheat oven to 375º and line a baking sheet with parchment paper. 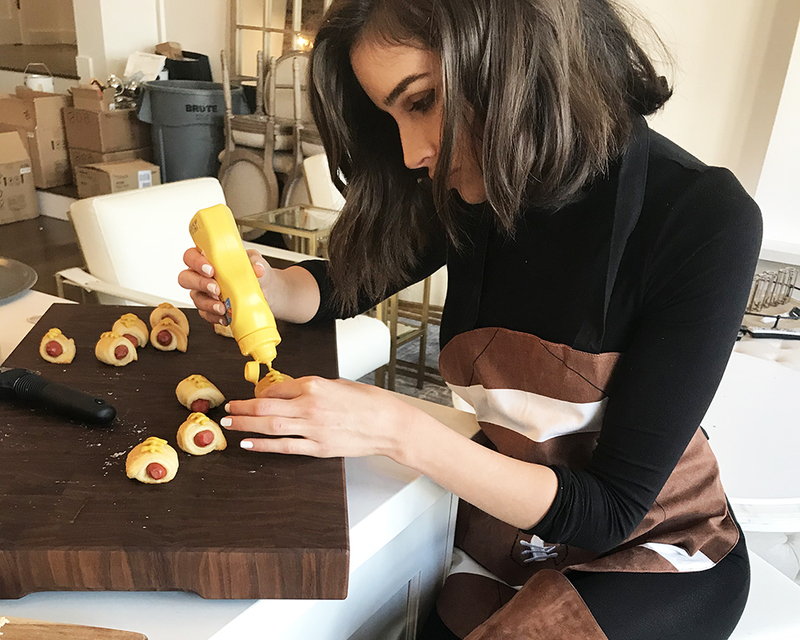 Slice the crescent rolls into thirds and put a mini hot dog on the wide end of the triangle, then roll up. Brush with egg wash and add a dash of salt and pepper, then bake for 15 to 20 minutes. 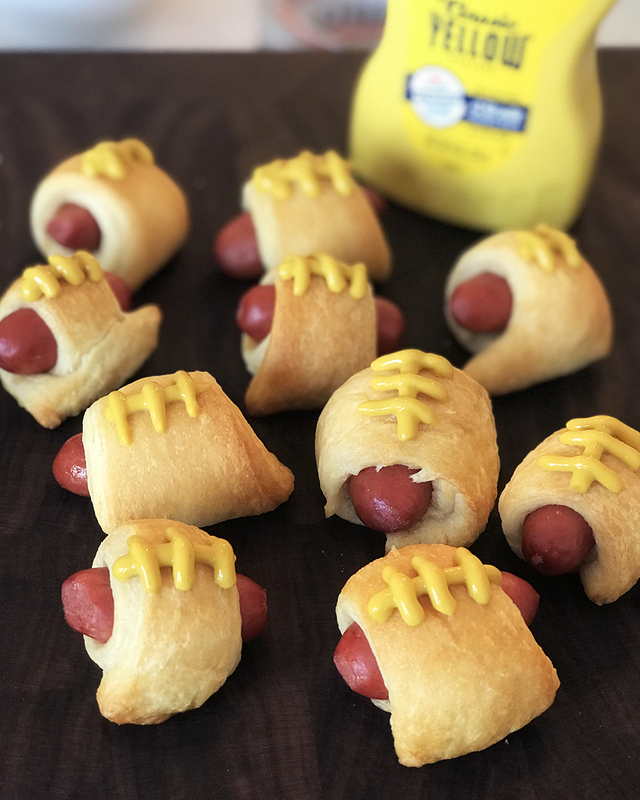 Use ketchup or mustard to draw “football laces” on the pigs in a blanket. Let cool, then serve. 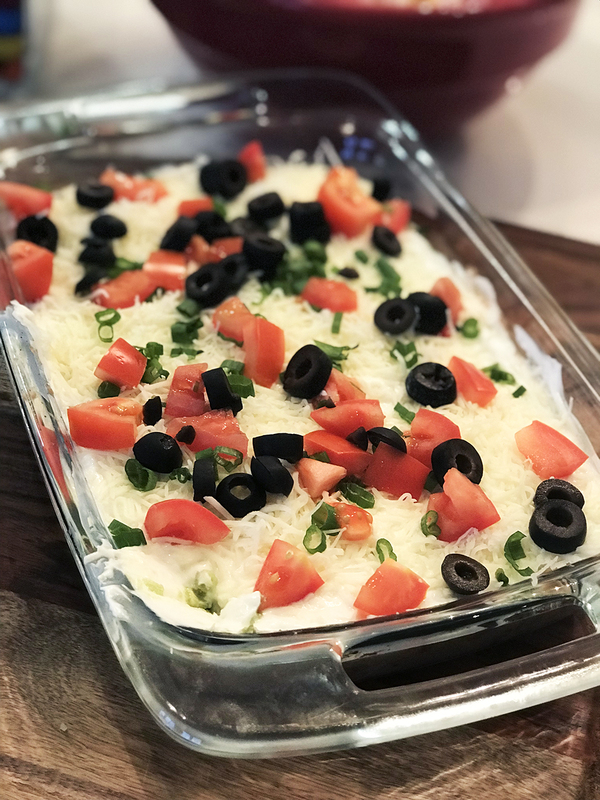 7 layer dip is a hallmark of Super Bowl parties, and this homemade recipe is incredibly tasty. Stir refried beans, canned tomatos, chili powder, garlic powder, and salt and pepper (to taste) in a mixing bowl. Spread mixture evenly in a baking dish. Mash avocado and add lime juice, then add in cilantro and garlic powder, with salt to taste. Spread avocado evenly over bean layer, then spread sour cream over avocado. Top with cheese, olives, tomatoes and green onions. Enjoy immediately or keep refrigerated until serving. 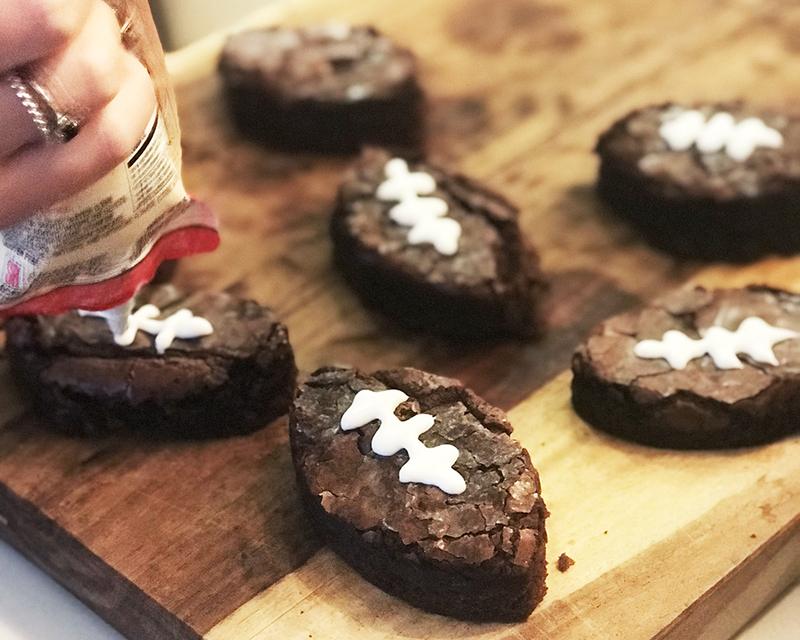 Give your classic brownie recipe a game day makeover and turn them into football treats with the help of a cookie cutter and some frosting. If you are looking for a great brownie mix, try the Ghirardelli, its so rich and delicious. 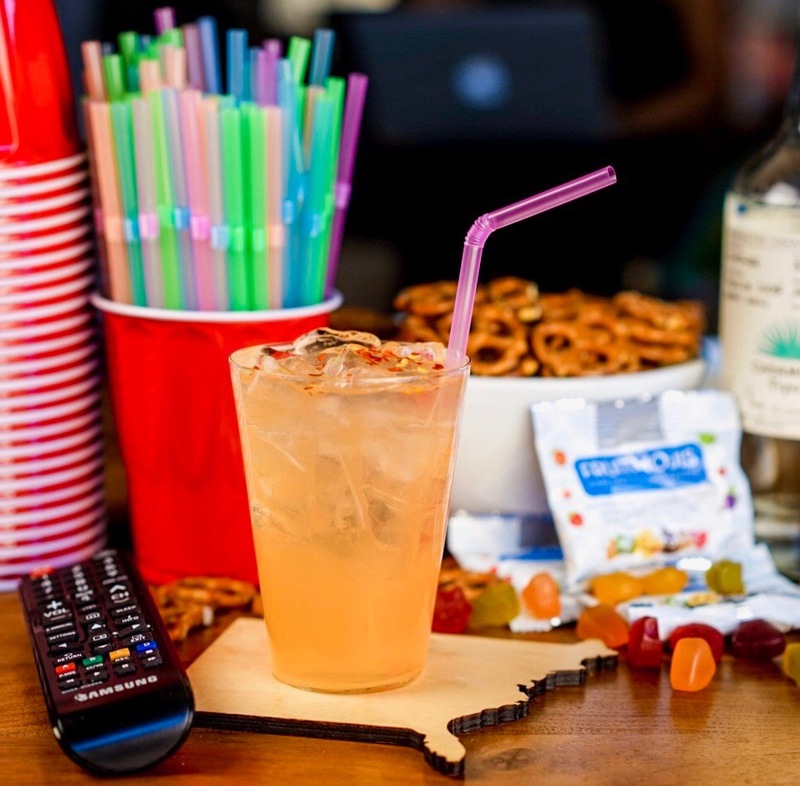 This is another snack that is so easy to make and perfect for a game viewing party. Recipe from Two Sisters Crafting. Place pretzels on a cookie sheet, then place a Rollo in the middle of each pretzel. Place in a 250º oven for 2 to 2 ½ minutes. Add an M&M on top of each pretzel bite. This is another super easy way to turn a party favorite (who doesn’t love pizza?) into a game day treat. 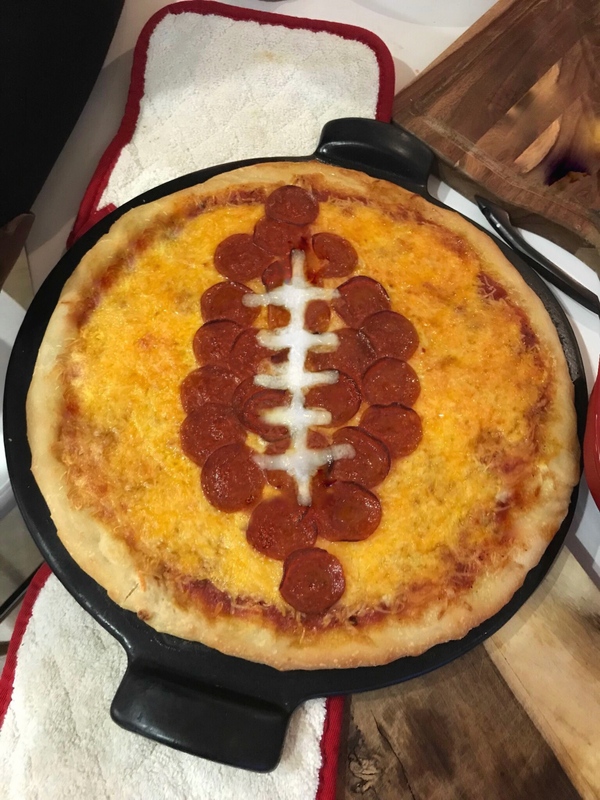 All you have to do is take a normal cheese pizza and use pepperoni slices to create a football shape. Add strategically-placed cheese to make the laces, and you have a party-ready pizza. 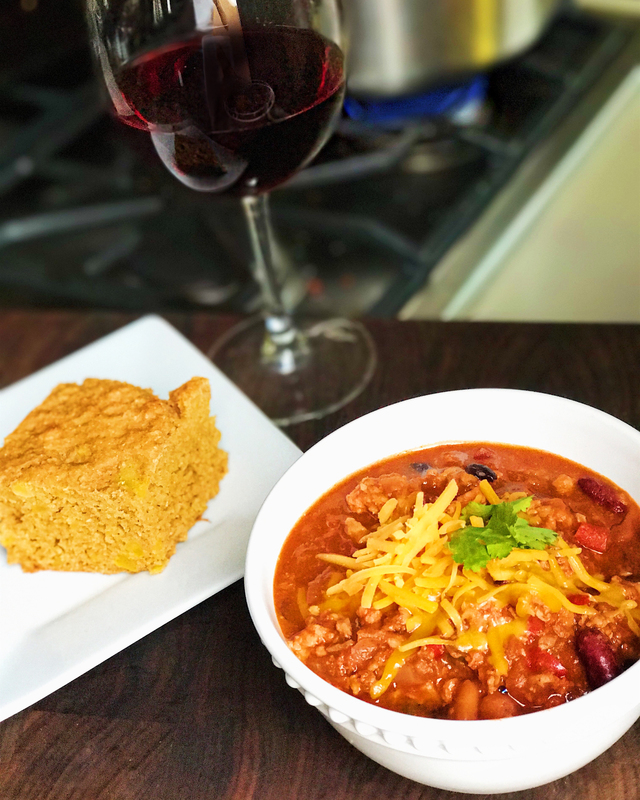 My homemade chili recipe is the perfect companion for watching football. 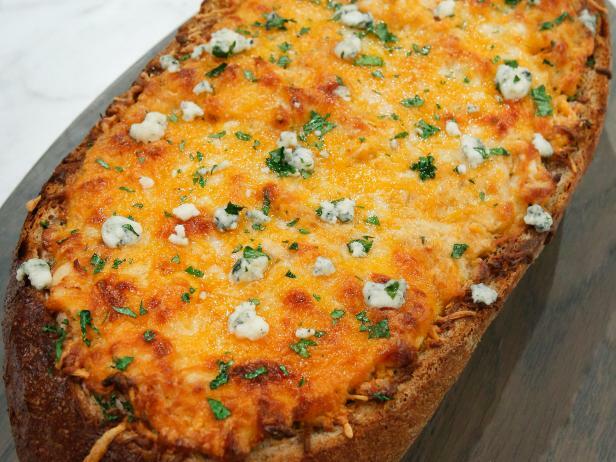 Serve this for dinner during halftime and enjoy! Get the full recipe here. Everybody loves cookies, and this recipe is a winner. Want to add some team spirit to your cookies? 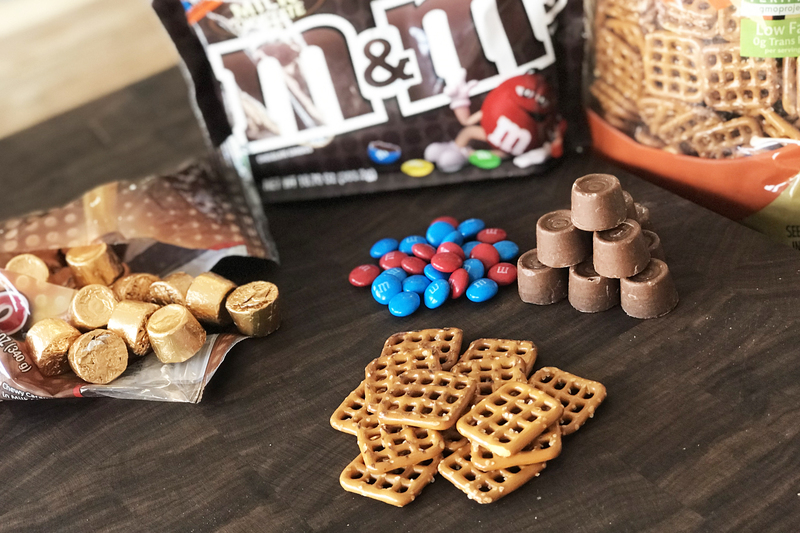 Use some of those M&M’s from your pretzel bites and add them on top of your cookies for some added flare. Mix butter and sugars together in a mixer, then add eggs and vanilla. Add flour, salt, baking soda, and baking powder. Mix until incorporated. Preheat oven to 350º F and roll dough into small balls. 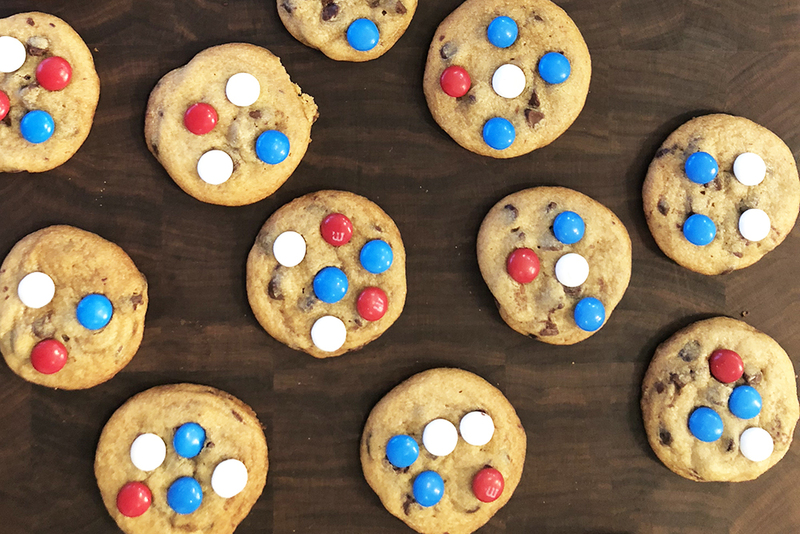 Add M&Ms to each ball, then place the cookie dough on a cookie sheet. Be sure not to overcrowd the sheet! Don’t let the lengthy ingredient list on this recipe scare you, its actually very easy to make and I promise will be one of the first dishes at your party to be finished! If you can, heat this up right when your guests arrive so it is served warm with the cheese melting. Cut a large rectangle through the top of the bread, but make sure not to cut through the bottom of the bread. Remove top and hollow out to middle to create a bread bowl. Mix together cream cheese, mayonnaise, hot sauce, sour cream, ranch dressing, salt, chili powder, garlic powder, paprika, and onion powder in bowl until combined. Add in bleu cheese, 3/4 cups cheddar and 3/4 cups mozzarella cheese and stir. Then add the chicken. *To make the chicken, I boil about 1.5 lbs of chicken breast and shred with a fork. With a spoon, add the mixture into the bread bowl and top with the rest of the cheddar and mozzarella cheese. Bake for 35-45 minutes on a baking tray, until cheese is melted and golden brown. Let bread cool for about 10 minutes, then slice and serve! For the 21+ guests at your party you are sure to please with these options. I personally like to make a big batch of each of these by multiplying the recipe and serving out a pitcher. Let me know which cocktail is a fan favorite at your party. Try some of these at your party and let me know what you think! Go Patriots! !